It’s all about making learning fun! 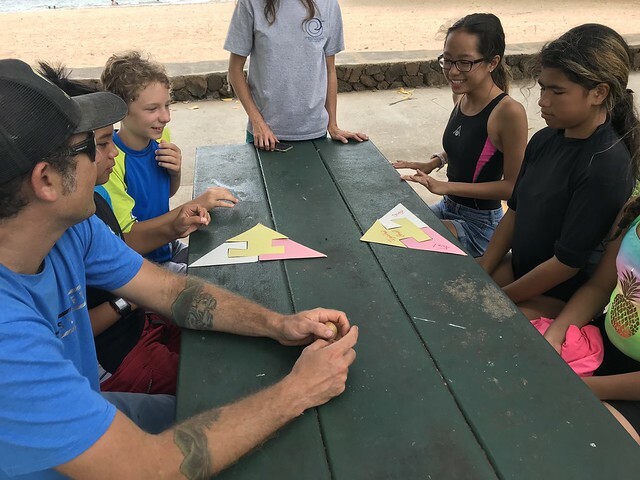 HWMO once again teamed up with Malama Kai Foundation’s Ocean Warriors program to educate middle school students about wildfire issues and solutions. The Ocean Warriors program is a youth environmental engagement and empowerment program that has kids become directly involved in projects, be a part of bigger solutions, raise money toward open space protection, and save vulnerable wild spaces, including those vulnerable to wildfire. At Spencer Beach, the kids learned from HWMO staff the importance of preventing wildfire in order to protect the entire watershed from summit to sea. They then had the opportunity to turn their newfound knowledge into spoken word. HWMO’s Pablo Akira Beimler — Community Outreach Coordinator by day, slam poet by night — gave tips on how to write spoken word poetry, which the kids then turned into their own environmental poetry…and their poetry and performances did not disappoint! Such bright future artists and leaders!